CNN) - Officials in West Texas said Monday they are investigating the "suspicious" death of a 3-year-old boy, adopted from Russia, and a Russian official blamed the death on "inhuman abuse." The boy was born on January 9, 2010, and died on January 21, 2013, according to Konstantin Dolgov, the Russian Foreign Ministry's special representative for human rights. This comes amid a tense time between the U.S. and Russia, after Russia moved to ban U.S. adoptions in December. Today on "Starting Point," Adam Pertman, executive director of Evan B. Donaldson Adoption Institute, on Russian-U.S. adoption stalemate. The United Nations is pressing the U.S. to accept Iran into the talks about the violence in Syria. U.N. Secretary General Ban Ki-moon believes Iran should be part of the broad discussion about the country and the fate of the President Bashar al-Assad. Iran has previously been sanctioned by the United Nations. Ban's comments came after President Obama and Russian President Putin came down in tense fashion talking about the Syrian conflict. Russia has blocked the U.N. Security Council resolutions against Assad's regime. The Two leaders insist progress was made during the talk and they agreed to work with all "interested parties." This morning on "Starting Point," fmr. U.S. Ambassador to Iraq John Negroponte weighs in on whether bringing Iran into Syria talks makes sense, what role Russia should be playing in discussions and if the Obama Administration is to blame for failing to take a lead on quelling the violence. Eleven countries have now kicked out their Syrian ambassadors, including the U.S., Australia, Britain, France, Germany, Italy, Spain, Canada, Bulgaria, The Netherlands and Japan. In just a few hours, the U.N. security council meets to talk about what to do now, after a massacre in the town of Houla where 108 civilians were killed and nearly half were children. UN envoy Kofi Annan, who's been meeting with Syrian leader Bashar al-Assad, says Assad himself "condemned the killings too." He even vowed to organize an investigation but many say the Syrian government is the one to blame. The White House insists military action is not the right course of action, but GOP presidential candidate Mitt Romney thinks otherwise. He released a statement saying "we should work with partners to arm the opposition so they can defend themselves." This morning on "Starting Point with Soledad O'Brien," Intelligence committee chairman Congressman Mike Rogers (R-MI) says the U.S.'s best response at this point is to work with the Arab League and allies to confront Syria. "I'm not sure arming is the right answer here," Rep. Rogers says. "We're just not exactly sure who the bad guys are and who the good guys are right now in Syria. You don't know who you're giving weapons to." "A more concerted effort by standing shoulder to shoulder with the Arab League, who does want to do more in Syria, is probably the best course of action," Rep. Rogers adds. In the video below, Rep. Rogers also explains how public pressure could force Russia to take a different stance on Syria and further condemn their actions. 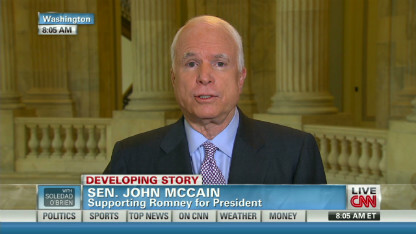 Sen. McCain says "I'd like the President to say 'here are the red lines.' If Iranians cross those red lines, action will be taken." He adds: "If there was a country in our hemisphere dedicated to our destruction, I don't think we'd rely on another country for our security." 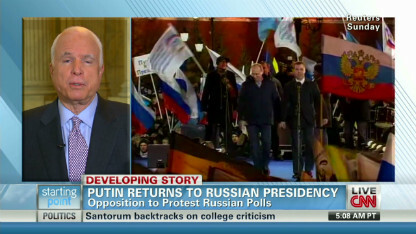 McCain says "Putin's days are numbered" and the protests in the country indicate that the middle class in Russia won't accept the election results. McCain responds to RNC chair Reince Priebus's claim that a long, drawn-out primary is good for the party. McCain say it's not the length, but the tenor of the race that he has a problem with. McCain says he won't be watching it. "It's a great piece for re-election for President Obama...I have better use of my time." Sen. John McCain (R-AZ) says President Obama should better define consequences for Iran if they develop nuclear weapons. McCain: "Putin's days are numbered"
Sen. John McCain (R-AZ) says middle class in Russia won't stand for a Vladimir Putin election victory in Russia. 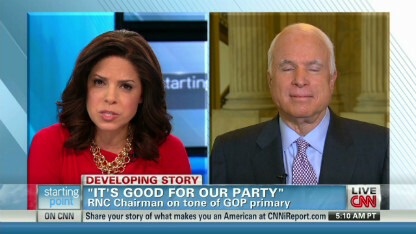 Sen. John McCain (R-AZ) responds to RNC chair Reince Priebus's claim that a tough primary is good for the party. 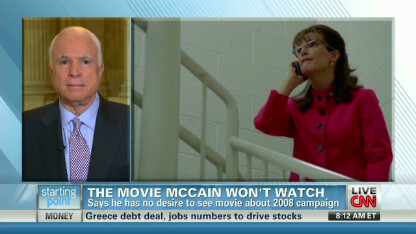 Arizona Sen. John McCain says he has a better things to do than watch the HBO movie "Game Change."